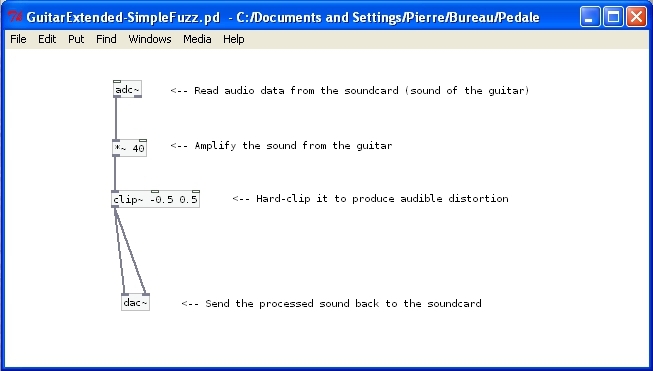 This is a simple how-to to create a basic fuzz/distortion effect for the guitar with Pure Data. Even though a nice fuzz tone is difficult to get digitally, the simple patch below is very easy to replicate and should nonetheless sound exciting to beginners. The sound is distorted by amplifying it before applying hard-clipping. The result sounds close to what you’d get if you raised the gain of the input of your soundcard to make it clip. For dummies, here‘s the patch for the fuzz effect. This entry was posted in Simple effects and tagged distortion, effect, fuzz, guitar, overdrive pure data, pd. Bookmark the permalink. these effects can be used in real time? I’m not very familiar with pd, and I need a voice distorted from a microphone …. Yes they can, this is one of the strengths of Pd. You’ll need a linux distribution with real-time capabilities along with the JACK audio server to use Pd in real-time. Please read my posts about software for more information about how to set up your machine. Any kind of input can be used in Pd, so using it with your voice is fine.